The Eastern Shore of Maryland is comprised of nine counties with a population of nearly 450 thousand. The term Eastern Shore distinguishes a territorial part of the State from the land west of Chesapeake Bay. 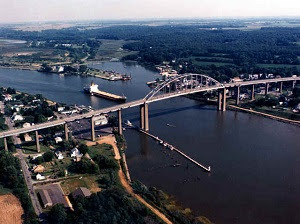 The Chesapeake and Delaware Canal was a shallow canal with locks after its construction in 1829; it was deepened in the early 20th century to sea level. The north-south section of the Mason-Dixon Line forms the border between Maryland and Delaware. The border was originally marked every mile by a stone, and every five miles by a crownstone. It was surveyed as a compromise solution to a century-long wrangle between the Penn and Calvert families. Commercial east-west ties between Delaware and Maryland towns were culturally significant in Colonial and Early American periods despite the border line. Trade with Philadelphia was conducted by overland routes to Delaware towns like Smyrna and Odessa; these cultural connections continue to this day. Saint Michaels derives its name from the Episcopal Parish established in 1677 which attracted settlers that grew tobacco and engaged in shipbuilding. The town's tourist industry has roots in the 19th century with steamboats from Baltimore and summer guest cottages opening for weeklong rentals. The opening of the maritime museum in 1965, waterfront activities and historic bay vessels added further impetus to travel and vacations to the town. 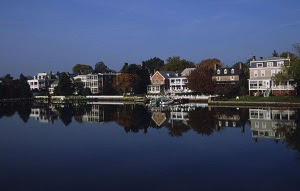 Chestertown was founded in 1706 and achieved prominence as one of six Royal Ports of Entry becoming Maryland’s second port after Annapolis and second to the State Capital in the number of 18th century mansions owned by a flourishing merchant class along the Chester River waterfront. In May 1774, five months after the British closed the port of Boston after the Boston Tea Party, the citizens of Chestertown wrote a set of resolves that prohibited the buying, selling, or drinking of tea. Based on these resolves, a popular legend has it that the citizens held their own tea party on the Chester River, in an act of colonial defiance. The Chestertown Tea Party Festival celebrates Chestertown's colonial heritage with a weekend of events with colonial music and dance, fife and drum performances, puppet shows, colonial crafts demonstrations and sales, military drills, and a walking tour of the historic district. In the afternoon, re-enactors board the schooner Sultana and tea is thrown into the Chester River. Cambridge was settled by English colonists in 1684 who developed farming on the Eastern Shore. The largest plantations were devoted first to tobacco, and then mixed farming. The town was a trading center and later a stop on the Underground Railroad, an extensive network of safe houses for slaves escaping to the north. Cambridge developed food processing industries in the late 19th century, canning oysters, tomatoes and sweet potatoes. Main Street is a comprehensive downtown revitalization process created by the Maryland Department of Housing and Community Development with a focus on heritage tourism. 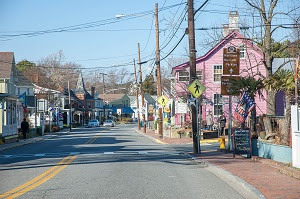 Salisbury is the largest town on the Eastern Shore and the commercial hub of the Delmarva Peninsula. The town’s oldest neighborhoods have Federal, Georgian, and Victorian architecture. Oxford traces its start from 1666 when 30 acres were laid out as a town called Oxford by William Stephens, Jr. enjoying prominence as an international shipping center surrounded by wealthy tobacco plantations. Early inhabitants included Robert Morris, Sr., who greatly influenced the town's growth; his son, Robert Morris, Jr., known as the financier of the Revolution; Jeremiah Banning, sea captain, war hero, and statesman; The Reverend Thomas Bacon, Anglican clergyman who wrote the first compilation of the laws of Maryland. Oxford has the oldest privately operated ferry service still in continuous use in the United States originally established in 1683.